Rolls always sound like gifts. With attractive exteriors giving way to the absolutely charming surprises contained in the inner layers, indeed they are gifts for your palate. Rolls like the Mawa Kesar Roll and Chocolate Pinwheels are desserts, which tempt you to gobble up many more than one! Jam Rolls have such a dainty appearance that you cannot resist grabbing one! Like open sandwiches, the unique selling proposition of Jam Rolls is that you can see what is inside, due to the exciting spiral shape in which it is cut – this makes the rolls totally irresistible. These classic light and airy rolls can be served either as a cake or as a pudding. The classic light and airy roll. Can be served both as a cake and as a pudding. Vanilla ice-cream and raisins rolled into chocolate cake make a terrific combination. A Swiss Roll presentation with strawberries and custard rolled within thin lightened sponge cake. This is a sweet dish made of mango and khoya! simply delicious! Whipped cream or cold milk can be poured a bit on top of the cake. Sometimes you may find it difficult to make into balls because of the stickiness of butter so keep in the fridge for 10 mins so it will be easier to make it into balls. Piata choco roll or pista choco roll is a delicious mithai or Indian dessert recipe with grated khoya cooked with sugar and rolled out in two parts. The one part is mixed with cocoa powder while the other has pistachios. The chocolate rolls are sliced and served as mithai after meals. A date roll is an easy dessert recipe to prepare an interesting mithai or Indian sweets with dates or khajur. The date roll is a favorite recipe among children owing to its awesome taste and appealing looks. A Swiss roll or jelly roll is an awesome dessert recipe with sponge cake rolls filled with jelly in the middle. 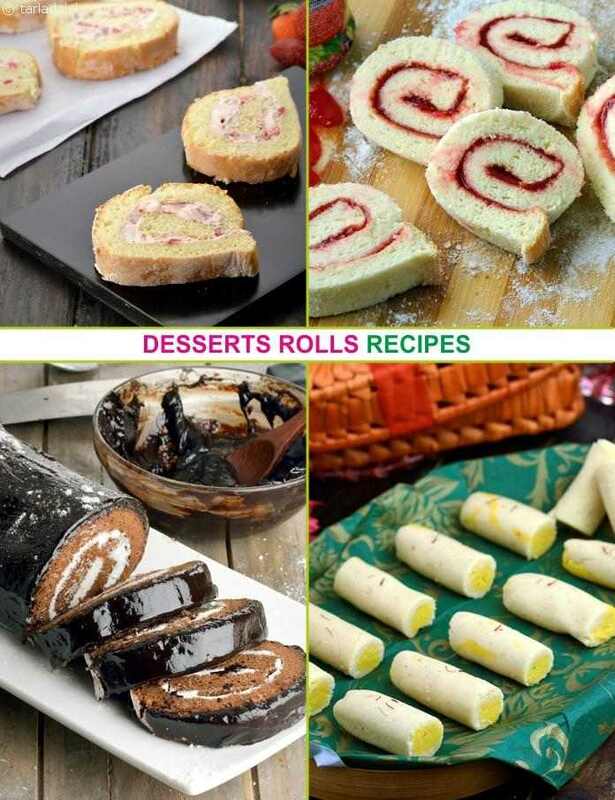 The swiss roll is simple and popular dessert recipe, especially among the children. Chocolate roll is a delicious mithai or Indian dessert recipe with grated khoya cooked with sugar and rolled out in two parts. The one part is mixed with cocoa powder while the other has crushed nuts. The chocolate rolls are sliced and served as mithai after meals. Try adding a little coffee or chocolate to the mixture for a different flavour. An interesting recipe, Ice-cream roll has cold ice cream sandwiched in between the cake roll and then frozen. This frozen sweet delicacy, ice cream roll is best reserved for special functions and parties.